( September 16, 2012, Chennai, Sri Lanka Guardian) NEERAJ JAIN is the convenor of Lokayat, a social activist group in Pune, Maharashtra that is part of the all-India National Alliance of Anti-Nuclear Movements (NAAM). Jain, who trained in electrical engineering, is the author of Nuclear Energy: Technology from Hell (Aakar Books, Delhi 2012). He was interviewed by B. Skanthakumar on 5 September 2012, before the confrontation five days later during fuel-loading of the Koodankulam nuclear reactor, in which one fisherman was shot dead and dozens were injured, sparking strikes and agitations across Tamil Nadu, including in Chennai, Coimbatore, Erode and Thootukudi. What is the background to the upsurge of peoples’ movements against nuclear energy in India today? The Indian National Congress-led government is going for nuclear energy in a big way, claiming that it is cheap, clean and safe, and the solution to the country’s energy needs. This expansion of nuclear energy is a follow-up to the Indo-US nuclear deal [in 2008]. The Indian government agreed to buy US$150 billion worth of nuclear reactors, equipment and other materials from the United States of America (US) in return for the US inking the agreement. Indian Prime Minister Manmohan Singh's special envoy, Shyam Saran, also promised that US companies would benefit for decades from Indian orders for military equipment. The quid pro quo was for the US to modify its laws and allow India to engage in nuclear commerce; from which it had been blocked after its nuclear tests in 1974. The US also lobbied with the Nuclear Suppliers Group (NSG) – which is an association of 45 countries which export uranium and nuclear technology – to grant India the waiver to engage in civilian nuclear trade, despite not having signed the Nuclear Non-Proliferation Treaty (NPT). In return, the Indian government promised the NSG countries that their companies would receive lucrative contracts in India. This was candidly admitted in an article in a leading newspaper of Maharashtra by the former chief of India’s Department of Atomic Energy, Anil Kakodkar. This is the real reason behind the Indian government opening its doors to Western nuclear energy companies. After putting the country on sale, it is now strutting about claiming that it has become a 'nuclear super-power', in addition to its claim to having become an 'economic super-power’. 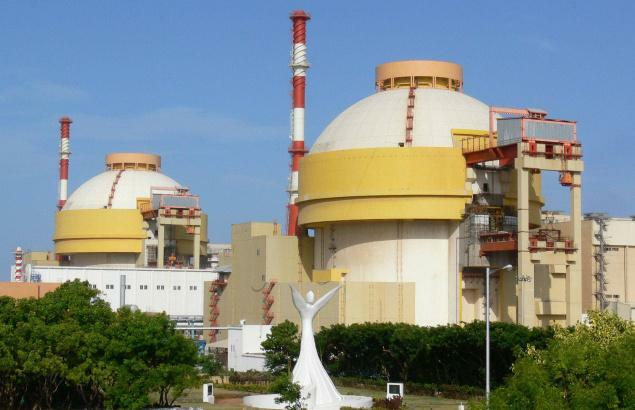 The government of India is setting up two kinds of nuclear plants. One group consists of those that are being established all along the coastline with imported reactors, which will be among the biggest plants in the world. These so-called ‘nuclear parks’ are in Gujarat (Mithivirdi), in Maharashtra (Jaitapur), in Tamil Nadu (Koodankulam), and in Andhra Pradesh (Kovvada). There was another plant proposed in West Bengal but a powerful peoples’ movement has halted it – temporarily at least – and possibly for good. There are also plans to build a nuclear plant at Markandi (Pati Sonapur) in Orissa. Ironically, despite the free market rhetoric of the Indian elite, there has been no competitive bidding for any of these plants. Instead, the government has allotted these plants to different foreign companies; even before the terms of the reactor contracts have been negotiated and the price finalised! In Jaitapur – where the French company Areva is setting up the plant – 940 hectares of land has been acquired from 2,300 families. The people who owned the lands refused to sell it, and so the government stepped in and forcibly acquired it invoking British colonial-era laws that allow acquisition of land for ‘public purposes’. When the Indian Prime Minister was asked the price of the reactors, he replied that pricing issues are still “subject matters of negotiations”! These extraordinary procedures give rise to suspicion of underhand deals. The plants in Andhra Pradesh and Gujarat are to be built by US companies GE Hitachi and Westinghouse; while the Koodankulam plant in Tamil Nadu is being built by a Russian company, Atomstroyexport. The other group of plants are the indigenous projects that are being set up by the Indian government in the interior of the country in places such as Gorakhpur (Haryana state) where four small reactors will be constructed – India only has the capacity to independently build small-scale plants – and in Chutka (Madhya Pradesh state). The nuclear reactors to be set up at the four nuclear parks along the coast are giant-sized and will produce between 1,000 and 1,600 megawatts each. The Jaitapur plant, where six reactors of 1,650 megawatts each are to be built, is going to be the biggest nuclear plant in the world. The EPR reactors being set-up here are of unproven design and are not in operation anywhere in the world. Nuclear energy is not a new source of energy in India though, so what accounts for the size and spread of the anti-nuclear energy movement recently? India has for sometime had nuclear energy power plants: 20 small scale plants, mostly of 220 megawatts each, at six different locations in the country. The first Indian plant was set-up in 1969 in Tarapur near Mumbai (formerly known as Bombay). The anti-nuclear movement in India is very old. The movement was especially strong in Kerala state, where no plants have ever been constructed because of the strength of opposition. The people of Kerala have forced the cancellation of the two plants proposed to be set up there. The construction of many other plants also saw powerful movements in opposition to them, in which protestors have died because of police violence. However, in the pre-internet age, and when the Indian media (radio and television) was under the control of the State, there was little information about these struggles. It is only receiving attention nationally and internationally now, thanks to advances in information and communications technology, as well as due to the growing strength of the movement through greater awareness of the dangers of nuclear energy among the people. The present anti-nuclear movement should therefore be seen as a continuation of these older struggles. Many of the leading activists in the current movement such as the nuclear scientist Dr. Surendra Gadekar, and Dr. S. P. Udayakumar of the Peoples’ Movement Against Nuclear Energy (PMANE), have been active for the last 10 or 20 years, and have been involved in the past agitations against nuclear plants. Additionally, there are several new factors which are contributing to the growing intensity of the anti-nuclear movement all over the country. These include the scale of the proposed plants along the Indian coast, which are massive even by international standards, and where the reactors are five to eight times larger than current Indian reactors; the controversial nature of the foreign companies concerned, such as Areva; and the safety record of those companies. For example, even pro-nuclear countries such as Britain and the United States have expressed serious reservations about the design of Areva's EPR reactor, and have not given it clearance to construct such reactors in their countries. The Russian VVER-1000 reactors being constructed in Koodankulam are no better. Even the International Atomic Energy Agency (IAEA), which is a cheerleader for the nuclear industry, has expressed concerns that these reactors don't meet Western safety standards, (which is not to say that Western standards are very good). Due to the huge size of these reactors, they are far more dangerous; and the consequence of a nuclear accident would be devastating and of unimaginable proportions. Obviously, this has contributed to the intensity of the current struggles. Furthermore, over the years, more and more information has been disseminated to the people on the dangers of nuclear energy. The effects of nuclear energy on communities near the uranium mines and existing plants is also becoming better known, including through independent surveys whose findings are now public knowledge. There is a large increase in cancer deaths and in births of deformed babies, and other health problems caused due to radiation: like diseases of old age in the young, fertility problems, spontaneous abortions, and so on. Fishing communities are devastated: in Tarapur where once there were 700 boats, now only 20 remain. People agitating against the new nuclear plants have visited these older plants, for example the people of Jaitapur region have visited the people of villages around the Tarapur plant. And so they are aware of the health effects of nuclear plants. Consequently, there are larger numbers of people, and in different parts of the country, participating in these agitations. Finally, the Fukushima disaster [in Japan on 11 March 2011] has had a major impact on the anti-nuclear sentiment of the people, and has strengthened the arguments of the movement. Even before the tragedy at Fukushima, the anti-nuclear energy movement in India had been quoting prominent nuclear scientists and saying that another accident at a nuclear reactor somewhere around the world would only be a matter of time, as nuclear plants are inherently prone to accidents. The Koodankulam Nuclear Power Plant is only 250 kilometres from Sri Lanka, but even after Fukushima, the Director of Sri Lanka’s Atomic Energy Authority insisted that “nuclear power plants are the cheapest and the safest mode of generating electricity ... and [that] the probability of a nuclear accident is very rare”. One of the most powerful propaganda arguments being given by the nuclear industry is that nuclear energy is the solution to the problems of global warming. Apart from the fact that nuclear energy is neither cheap nor safe, the reality is that it is not green too. It is true that a nuclear plant in itself does not produce greenhouse gases; however, the nuclear reactor cannot be viewed in isolation. The production of electricity by fissioning uranium depends upon a vast and complex process known as the nuclear fuel cycle, of which the nuclear reactor is only a part. And, the fact is, large quantities of fossil fuels are utilised during all the stages of the nuclear fuel cycle. The nuclear fuel cycle starts from the mining of uranium ore; the ore is then taken to the mill to extract uranium from the ore; next, the uranium is enriched; the enriched uranium is then fissioned in the nuclear plant; the plant generates huge quantities of radioactive waste which has to be safely stored for thousands of years; and finally the reactor has to be decommissioned after it has completed its life-span of between 40 and up to 60 years. All these processes are highly energy consuming, in which huge amounts of fossil fuels are burned. For instance, building the reactor itself requires huge amounts of cement and steel; and the manufacturing process of steel and cement releases large quantities of greenhouse gases. The worst part is that the nuclear waste generated in the reactor has to be stored for thousands of years, that is, for so long as it continues to emit significant amounts of radiation. Obviously, the safe storage of the waste is going to consume large amounts of energy – no one knows how much. The pro-nuclear propaganda conveniently forgets the whole nuclear cycle and only focuses on the functioning of the nuclear reactor itself. Therefore, neither is nuclear energy green, nor is it the solution for the global warming crisis. The most critical issue is that nuclear energy is not safe at all. During the process of making electricity from uranium, that is, during the entire nuclear fuel cycle – in the mining of uranium, followed by purification and enrichment, and then in the reactor itself – radiation is released at every stage into the atmosphere. The impact of this radiation on human beings is deathly: it causes cancer, mutates the reproductive genes so that children are born deformed, and also causes many other diseases. Let us consider the nuclear reactor itself. The process of splitting uranium in nuclear reactors creates more than 200 new, radioactive elements that didn’t exist earlier in nature. The resulting uranium fuel is a billion times more radioactive than its original radioactive inventory. A regular 1,000 megawatt nuclear power plant contains an amount of radiation equivalent to that released by the explosion of 1,000 Hiroshima-sized bombs. These radioactive elements created in the reactor have half-lives of varying length from a few seconds to thousands and tens of thousands of years. Despite all the safeguards that are in place, it is impossible to prevent leakage of some amount of these radioactive elements into the atmosphere. Some of them inevitably leak out. They leak out in gaseous form and they leak out along with the steam discharged by the reactor. In fact, nuclear power plants are officially allowed to emit a defined (‘permissible’) amount of radiation. These elements are dispersed into the environment and will keep releasing radiation for hundreds and thousands of years. They will contaminate the water and soil, and will inevitably enter the food chain. Now, the nuclear plant will be decommissioned after around 40 to a maximum of 60 years; but because these radioactive elements can remain in the eco-system for thousands of years, countless generations of people living in its vicinity will be poisoned by radiation, long after all trace of the power plant itself has gone. It should be emphasised that this process cannot be undone; because radiation will be present in the air we breathe, the water we drink, and the soil we cultivate for our food. There is no known means of decontaminating our eco-system. The only option for human beings is to flee from those areas and abandon them altogether. Turning to the issue of nuclear waste: a 1,000 megawatt nuclear power plant produces 30 tonnes of radioactive waste in a year. So, for example, the 10,000 megawatt Jaitapur plant will produce 18,000 tonnes of waste over its maximum life of six decades. This waste is the most toxic substance known to human-kind. For instance, one percent of it is plutonium, which has a half-life of 24,000 years, and so will remain radioactive for 200,000 years. It is so carcinogenic that less than one-millionth of a gram, if inhaled, will cause lung cancer. The nuclear waste is so radioactive that humans cannot approach or handle it – it has to be removed by robots. Now, how do you store this nuclear waste in such a way that humans do not come into contact with it? How do you store something that is so corrosive, that is at such high temperature, and emitting such intense radiation? How do you store nuclear waste safely for even 200 years, leave alone 200,000? How can you guarantee that the container in which the waste is stored will survive even 200 years? Material science is only 100 years old, and if you make such a container which you claim will last 200 years, how do you know that it will? That is why around the world, the current practice is to store the waste in temporary storage sites near the reactors, either in huge cooling pools or in dry storage casks. And everywhere these storage facilities are leaking; to contaminate the environment for innumerable generations. Of course, with time, as the volume of leakage increases, so does the level of radiation. Finally, let us consider the possibility of a major nuclear accident. Nuclear plants are inherently prone to accidents. Many nuclear scientists have emphatically stated that with nuclear technology, you can't guarantee that accidents will not take place. The event of a nuclear accident is a singular catastrophe because it affects tens of thousands of people (at the minimum), and remember, for thousands of years. So, even one such accident cannot be afforded by humanity. The Chernobyl nuclear accident [on 26 April 1986 in present Ukraine] affected half of the globe. A study published by the New York Academy of Sciences in 2009 estimates that 1,000,000 (one million) people have died worldwide over the period 1986-2004 due to diseases caused by radiation releases from this disaster. And this number will keep increasing in the years to come. In the case of Fukushima, a greater tragedy was averted because much of the radiation was dispersed over the sea. Even then, recent studies in Tokyo, which is around 240 kilometres from the site of the nuclear accident, have shown that radiation from Fukushima has contaminated that city and the millions who live and work in it. Independent scientists from Europe and the US have estimated that there will be at least a million cancers in Japan over the next 30 years as a direct result of the accident at the Fukushima nuclear power plant. Radiation has spread from Japan to around the world; traces have been detected as far away as in Switzerland and the US. India, which is far more populous than the former Soviet Union and Japan, has not even been able to cope with the Bhopal Gas disaster [the leak of methyl isocyanate gas on 2-3 December 1984 in Bhopal in Madhya Pradesh state believed to have caused at least 20,000 deaths and injury to around 570,000], and the rehabilitation needs of those affected. How can India, or for that matter Sri Lanka, cope with a nuclear accident? The peoples’ movement in Koodankulam is under severe repression but continues to inspire anti-nuclear struggles in the rest of India and around the world. The anti-Koodankulam struggle is probably one of India’s largest social movements in recent years. Between 60,000 to 70,000 people have so far participated in this agitation. It is a Gandhian non-violent movement of resistance. The people mobilised are extremely well-informed of the hazards of nuclear energy. The activism and bravery of the women, in particular, has been the subject of many short films and media reports. The villagers living around Koodankulam are well-aware of the issues because there is an existing nuclear power plant in Tamil Nadu state (in Kalpakkam). They know the health impact of the Kalpakkam nuclear plant on the people living in the nearby villages. So, the dangers and the consequences are understood. They know that pro-nuclear energy scientists are lying to them because the claims that they make for nuclear power are so absurd. The nuclear energy lobby refuses to engage in debate with its opponents, which causes people to believe that it has something to hide. It refuses to release scientific reports on the safety of the plants; it refuses to release the site evaluation report; it refuses to conduct environmental impact assessment on the flimsy argument that the Koodankulam plant had been approved in 1988, when the law providing for environmental assessment for large projects was not in force. Yet, they claim that the plant is safe. So, how can the people in the area believe them? The Indian government has stated that in accordance with an agreement with Russia, the Russian company building the reactor will not be liable for any accident in the reactor, implying that the Indian government will bear the health and environmental costs. If the plant is so safe, people ask, then why do the manufacturers want to indemnify themselves from liability for accidents? Unfortunately, the massive propaganda campaign in the rest of Tamil Nadu (which is badly affected by power shortages), including deploying former Indian President and missile scientist APJ Abdul Kalam, has succeeded in convincing people living in areas far away from the plant that nuclear power energy is feasible and desirable. The government has engaged in a smear campaign to discredit the ‘Peoples Movement Against Nuclear Energy’ in Koodankulam, describing it as funded by western non-governmental-organisations; and emphasising the Christian faith of the fisher-people at the forefront of the movement, as well as the participation of the local Catholic clergy. 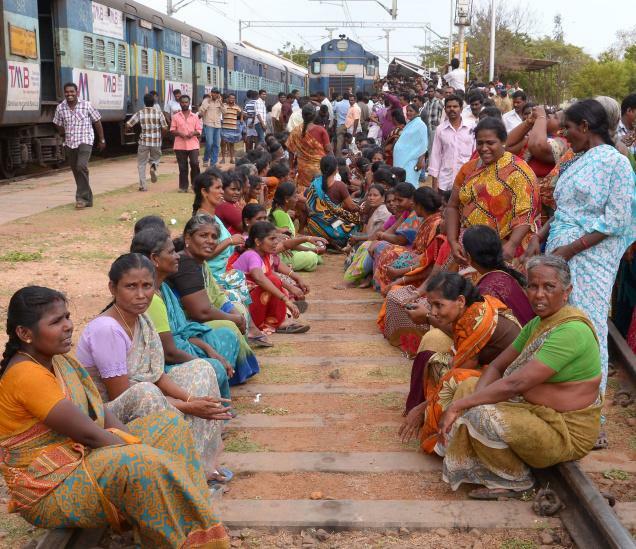 The government has clamped down heavily on the protestors against the Koodankulam plant. The main site of the agitation is the village of Idinthakarai which is six kilometres from the power plant. The protestors have been virtually encircled by the police who have blocked the access roads into their village, and created bunkers using sand-bags to fortify their positions. False cases under the Indian Penal Code have been filed against more than 56,000 protestors; the charges include 'sedition' and ‘waging war against the state’. The leaders of the movement have not left the village in months, because they expect to be arrested by the police if they do so. The leaders are surrounded by several thousands who are protecting them from any attempt by the police to arrest or otherwise harm them. The only region in the world where nuclear power plants are presently being constructed is in Asia. New plants are proposed or are under construction in China, South Korea, Bangladesh, Pakistan, and of course, India. Therefore, there is a strong need for Asian people to come together to support each other. We need to block companies in our countries that are producing components or supplying materials for the construction of nuclear plants in other countries: for instance, Japanese and South Korean companies are engaged in nuclear commerce with other Asian countries. We also need to link up with activists in Western countries. Australian people should demand that the uranium mined there not be exported for nuclear energy. We also want anti-nuclear activists from Western countries, especially scientists and legislators, to come to India and link-up with the movement here. Their solidarity can be used to counter the pro-nuclear propaganda in the mainstream media. Nuclear energy is not a national issue – it is a global issue; because radiation and the effects of nuclear accidents do not respect state boundaries. A nuclear accident can radioactively contaminate half the globe. The people protesting in Koodankulam are not only fighting for their health and livelihoods; they are not only fighting for the peoples’ of India; they are fighting for the right to life of the peoples’ of the entire world, and for the healthy lives of our unborn generations. It is the duty of all conscious human beings, wherever they are, to join the struggle against nuclear energy. இடிந்தகரை மக்களின் போராட்டம் ஆக்க சக்தி!